Advance CTE has just released a Policy Benchmark Tool that will allow states to evaluate and improve their program approval policies. In this tool, Advance CTE has defined and described the non-negotiable elements of an effective policy for approving and evaluating programs of study, which encompass both secondary and postsecondary CTE. Any policy – be it regulatory, legislative or programmatic – related to ensuring high-quality CTE programs are developed and implemented should include and/or address the following core elements. While there may be other elements within a CTE program approval policy, if a state does not address the list below, its CTE program approval policy will not be able to sufficiently ensure that all CTE programs are high-quality. Secondary and postsecondary alignment and early postsecondary offerings: All CTE programs must vertically align across the secondary and postsecondary education levels to ensure seamless transitions for learners, and allow learners to earn credentials of value, including postsecondary certificates and degrees. Industry involvement: Industry partners at the state and local level must play an active role to identify, develop and regularly review CTE programs of study. Labor market demand: CTE programs must prepare learners for careers in high-skill and high-demand fields. High-quality instruction: Any CTE program must have appropriately certified instructors in place before being approved by the state. Ensuring instructors have the necessary academic content, knowledge of pedagogy and industry expertise must also be a top priority. Experiential learning: High-quality CTE programs must provide opportunities for learners to engage in authentic experiential learning both inside and outside of the classroom. 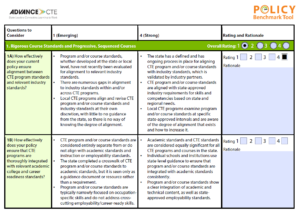 State leaders can use the CTE Program Approval Policy Assessment Rubric to identify gaps in their current state policy on these six criteria and prioritize policies that validate potential programs of study in a way that shows they are high-quality and are aligned with the state’s vision and definition of success. Once state leaders have completed an assessment of their state’s CTE program approval policies, they can begin planning for implementation using the templates and prompts. After they have completed these sections, state leaders can then examine the CTE Program Evaluation Policy Criteria for potential criteria to inform CTE program re-approval, evaluation and potentially phasing out CTE programs that are not deemed high-quality. To support its members in using this tool, Advance CTE has also created a facilitation guide for the rubric, and is eager to provide virtual and/or in-person assistance to a select number of interested states. Email Ashleigh McFadden at amcfadden@careertech.org for more information.